Once a Princely state, the Pudukottai District, is absorbing interest to Historians, Anthropologists, Archaeologists, and lovers of Arts and Architecture. The numerous megalithic dolmens and other forms in the district indicate the antiquity of this region. The history of Puddukottai is an epitome of the history of South India. The Pandyas, Cholas, Pallavas, Hoysalas, Vijayanagar, Nayaks, Irukkuvelirs, Mutharaiyars, Thondaiman rulers, have ruled over the region. These rulers have built several beautiful temples. The collector's office is situated in the New Palace, built by the Thondaiman ruler in Indo-Saracenic-Dravidian architecture. Avur It is 28 kms from Pudukkottai and 20 kms from Thiruchi. The beautiful church here is the oldest in the district. Father Joseph Beschi locally known as Veeramamunivar began his missionary life at Avur. The chapel here was constructed in 1747 in the form of a Cross. The Mother Mary is called locally Periyanayaki. The Easter festival attracts Christians and others. Kunnandar Koil Is about 25 kms from Pudukkottai on the Kiranur-Killukkottai road. There is a rock-cut cave temple at the foot of the hill. Kunnandarkoil is an interesting monument for archaeological studies. The Kalyana Mandapam in the Vijayanagar style in the form of a chariot drawn by horses is an interesting piece of art. The portrait sculptures in the cave are admirable. Thirupunavasal It is 70 kms from Pudukkottai and 30 kms from Avudaiyarkoil. The Shiva temple here is called Viruthapuraswarar Koil. It has huge lingam in the sanctum sanctorum. The Shaivite saints Thirunavukarasar and Thirugnana Samandar sang hymns in praise of the Lord here. The Vaikasi festival is the main feast in this temple. Kattubhava Pallivasal Kattubhava Dargah is situated in Pudukkottai District 10 kms from Thiumayam. Bhava Fakuriddin Aulia also known as Kattu Bhava is entombed here. The Nawab of Arcot built this dargah during 17th century. The people of all religions and faith with disparity Throng here. Kanthuri, the annual festival attracts large number of pilgrims from all parts of this region. 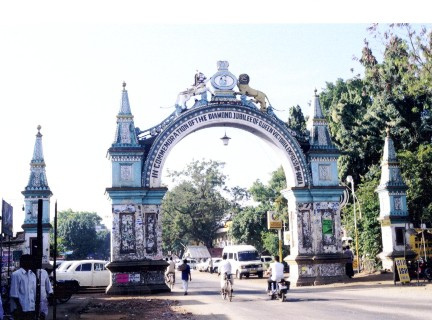 Kodumbalur : Kodumbalur is 35 Kms from pudukottai and 40Km from Tiruchirappalli. It is a place of archaeological importance. Kodumbalur is mentioned in silapathikaram, the Sangam Tamil Classic. The muvarkovil, Muchukundeswarar temple are the early chola temples located here. The muvarkovil built by Bhuti viramakesari in the 10th century A.D., is a fine example of Tamilian art and architecture. It is the fore runner of all the later grand chola monuments. The sculptures in the temple are charming. Kodumbalur presents a series of archeological treasures in the district. ASI Monument/Entrance Fee Indians Rs.5 Foreigners 2 US dollars or Rs.100.